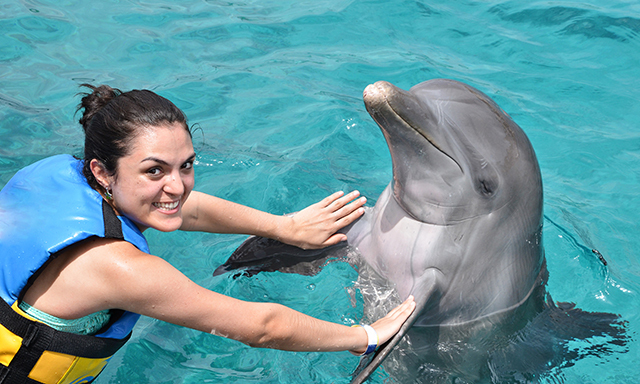 Have a magical encounter with both an enchanting bottlenose dolphin and a gentle green sea turtle. You'll be one with nature during your time at Dolphin Discovery and the Cayman Turtle Centre. Swim, pet, and play with your new friend, and even get a kiss on the cheek from your new dolphin friend. Next, spend some quality time with the green sea turtles, and learn about its an integral role in Grand Cayman's history and culture. • Dolphin Discovery: Enjoy 30 minutes of fun with your bottlenose dolphin friend, in a shallow, saltwater pool. • Cayman Turtle Centre: Take your time through this famous centre, home to 11,000 turtle residents. • Green Sea Turtles: Learn how these elegant creatures have impacted the culture and history of the island. Plus, get the chance to hold a yearling turtle in your hands. • The use of personal cameras is not permitted at the dolphin facility. Professional photos of your encounter are available for sale. • Pregnant women should not select this tour. • Guests with pre-existing neck, back, knee and/or shoulder injuries, cardiac conditions, asthma, diabetes, epilepsy, other heart or respiratory conditions or any other medical condition must take particular caution when selecting a tour — particularly tours categorized as "strenuous". • Guests under 12 years of age must be accompanied by an adult in the water.